most military bases do not allow soldiers to carry guns on their persons daily. Who knows why as there would not have been nearly as many casualties if they could. It is another example of a gun free crime safe area. This man shot his victims all unarmed soldiers in a medical processing facility. When police that were armed arrived he was shot and paralyzed. This post is nothing but misleading anti gun propaganda. If this man was not a coward he might have tried to kill soldiers at the base shooting range or at a public shooting range full of armed people. 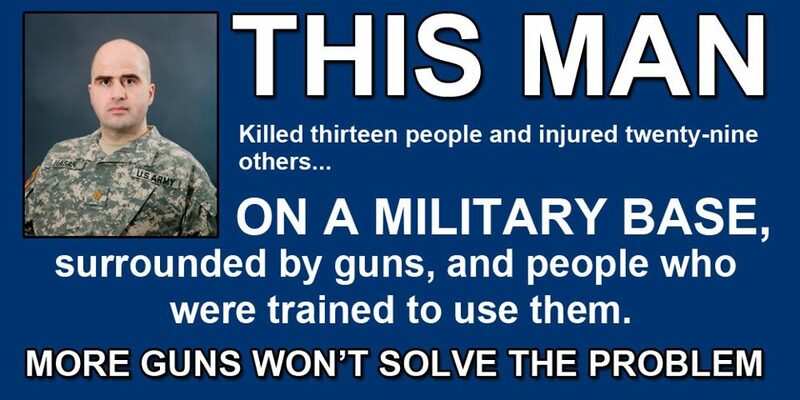 he also used a semi auto pistol to shot his victims no assault weapon/rifle was used. He had a revolver with him as well that was not used that's neither an assault weapon or semi automatic. My typo my post should read he used a semi automatic pistol to shoot not "shot" his victims.